"Customers first" is our primary policy. Daiwa Printing was established in 1951 in the central area of Tokyo, and since then, we have produced a lot of printing materials according to our customers' requirements such as newspapers, brochures, name cards, envelopes, and so on. We can supply high quality products with reasonable price. 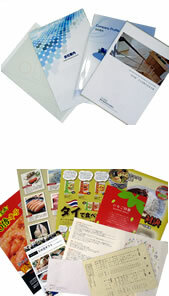 In addition, we can realize whatever you want for printing materials. c 2015 Daiwa Printing co.,ltd All Rights Reserved.